And yet another dive with the seahorses at Lilli Pilli… The forecast looked scary with wind warnings for the whole NSW coast and Sydney closed waters and predicted surge of 2-3 meters. I only learned today that the Leap had been diveable on Saturday – bugger… This piece of information was quite surprising for me as there was considerable surge off the beach in Cronulla already at 8 am on Saturday. In any case we decided to head off to Lilli Pilli and say hello to our seahorse friends. The conditions were similar to last week – fairly good visibility, but lots of particles in the water. I was quite positive that this time I was able to get the seahorses in focus since I knew now that the macro focus setting is not saved in manual mode when the camera is turned off. We stayed another hour around the net in Lilli Pilli baths. It took me around ten minutes to find a seahorse this time, at the end of the dive I had counted seven, and spent a lot of time close to three of them annoying them with the strobe. The main difficulty for me was to place the strobe correctly to avoid backscattering but still being able to light the seahorses which were usually either just in the net or dangling out on the backside of it. The net would produce shades if the strobe as placed too far away from the lens. All in all I am quite happy with the shots I got, even though I was not able to avoid backscattering in the background. The standard camera setting I used was f/8.0 aperture and a shutter speed of 1/125 s. When playing with the background colour I used shutter speed as slow as 1/40 s and opened the aperture to a maximum of f/5.0. This allowed me to change the background from almost black to a glowing green. 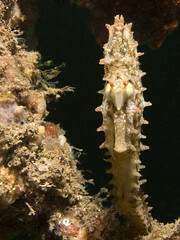 For the standard setting with strobe distances to the seahorse of about 0.5 m I used strobe powers between ½ and ¼, as usual with the -0.5 EV diffuser on. For the opened up aperture I adjusted the strobe power to ¼ – 1/8. All in all this was a very pleasant dive to gain further experience with my camera equipment. I am well able by now to take a shot, evaluate the picture on the display (the in-built histogram and the focus control are very convenient tools for that matter) and make corresponding adjustments to get the exposure right. This is ok for macro shots of not so much moving objects (the seahorses were posing at times…), for one-single-shot occasions I will have to improve my skills of assessing the situation and choosing proper aperture and strobe settings. This entry was posted on June 23, 2008 at 10:24 pm and is filed under Divelog, Diving in Sydney, Underwater Photography. You can follow any responses to this entry through the RSS 2.0 feed. You can leave a response, or trackback from your own site.